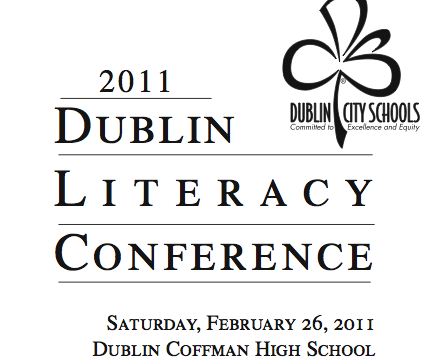 Today is the annual Dublin Literacy Conference (which as a side note, looks to be amazing!! ), and Bill and I will be presenting again in a small breakout session. 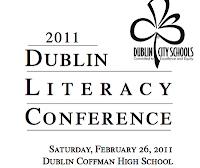 Since we started Literate Lives 3 years ago, we have offered to share the books we love each year at this conference. Our current attendance number for our breakout session is designated at 44 educators. We're very excited about that, but when I saw that concrete number, it immediately made me reflect on what I've learned during my PLP experience this year -- the importance of collaboration, communication, creation, and connections beyond the 4 walls of the classroom. Since I believe all four are essential to my continued learning, I realized that I wanted this list that Bill and I have created to reach a larger audience than just the people who signed up for our session - though I would like to say a huge thank you to each one of them for choosing to spend time with us on a very busy Saturday!! With that in mind, I am adding the link to our booklist here (it sits in a googledoc site that is public to people with this link). Hopefully, you won't have any difficulty accessing the site. My hope is to continue the idea of collaboration, communication, creation, and connections with this booklist. Once you look at our booklist, please stop back and share with us and the rest of our community what books we didn't include that you think should be there and why. Our list is by no means comprehensive, but with just a few exceptions, we are only sharing books published in 2010 or thus far in 2011. If we missed something, we'd love to have you add to our thinking. We are much smarter as a group than we are individually - thanks for collaborating and connecting with us!! 1. I love author visits! It's such a great experience for our kids to meet real live authors, hopefully something some of them will always remember. 2. I love hearing authors read their own words! 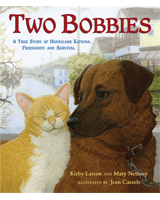 Kirby will feature her picture book Two Bobbies ane will read it to our younger students. She will highlight the features of non-fiction writing with our older students. 3. Hattie Big Sky was my first "Looking for Newbery" success. Even before this blog, back when I was still in the classroom, it was the first winner I read before the announcements. 4. Our Newbery Club will get to have a special lunch with a real live Newbery winning author. They area already formulating questions and knowing this special group of kids, the conversation will be awesome. 5. I haven't met very many authors, and this will be my first Newbery Winner, but I have always enjoyed the conversations about the state of children's books, what makes a good book, what they are working on, how they get their ideas and just getting to know them a little bit better over a short time. That's all I have for now, I just wanted to share the news! KIRBY LARSON IS COMING! New Book Clubs are Starting! It was so much fun to listen in to the "big" conversations students were having. Since these were our first book clubs of the year, we still need to work on the dynamics of group conversation, but overall, they did a fantastic job. After our initial success, I was excited to hear what they might want to participate in next. Last Friday, we met on the floor and took turns sharing books in which we thought others might be interested. I made two suggestions based on books I'd read recently, but the other recommendations once again came from the students. I'm very excited about their new choices (only one of my recommendations made their cut), and I'm looking forward to the dynamics of their new groups. Not everyone is participating in a book club this time (my requirement was at least 3 book clubs between the beginning of January and the end of May). That's okay. I know that the book that interests them and they might want to share with others could just be down the road. What I love when I look at this list of books is how different from one another these books are. My hope is that our book clubs reflect the interests of the individual students, and this list of books appears to be a good indication that they do. For now, I'm so excited to hear the conversations about the books they've selected in February! Sugar and Ice is Everything Nice! Sugar and Ice by Kate Messner was the perfect read today on a cold and snowy "ice" day. Although I was never even close to an elite athlete (I still shudder at the memory of me performing on the uneven parallel bars at a high school gymnastics meet! ), I am an avid fan of athletics. The main character in Sugar and Ice, Claire, is an incredibly gifted ice skater. I can't count how many times I've watched ice skating on tv or how often I've taped the Olympics when I knew the ice skaters would be performing. So, frequently throughout the story, when Claire was performing her routines, I could visualize what they looked like. Claire lives in Mojimuk Falls, NY, where she leads a fairly simple life -- middle school, helping out her family when it came to tapping the trees for maple sap, hanging out with her best friend, and skating. Claire loves to skate -- she skates on the cow pond as soon as it freezes, she skates at the town's ice rink, and she teaches younger children to skate as well. From time to time she performs in the annual Mojimuk Falls' annual skating exhibition. Only this year, a Russian coach who trains skaters at Lake Placid sees her performance and offers her a scholarship to train with him. What I loved about this story is that it really develops Claire as a character over time, and it also explores the somtimes unkind, cutthroat side of competitive skating. Remembering the Nancy Kerrigan incident at the Olympics so vividly, I was shocked at what a young age that can happen. I was glad Messner didn't make all the skaters like that, but it is a real problem in the story. But as Claire learns, grows, and develops as a skater, she is also doing the same as a person. Trying to balance her home life with her skating life, trying to maintain a friendship with her best friend from childhood, trying to develop new friendships with the skaters with whom she spends so much time, trying to navigate the feelings of having a crush on a boy -- Claire deals with all of this as well as the drama that awaits her on the ice. I can see my students (probably mostly girls) reading Sugar and Ice and having great conversations about how much they'd be willing to give up to follow a dream or a passion. All I will say is that Kate Messner wrote the perfect ending for Sugar and Ice - very rarely do I say that about a book, but this ending is just right. For another review, see Franki's post at A Year of Reading. Thaddeus A. Ledbetter Needs No Defense! If you ever need someone to help you prepare for whatever dangers lie ahead of you, Thaddeus is your man! If you ever need an old-fashioned chuckle, Thaddeus is your man. And, if you want to meet a character that is far more complex than initially meets the eye, Thaddeus is your man as well. Today, on my "ice day", I read The Defense of Thaddeus A. Ledbetter by John Gosselink. Gosselink is an English teacher, and I think that is why he creates such a believable character. Thaddeus is most likely a compilation of many former students of his (as well as some students to whom most teachers can relate). I enjoyed the organization of the book -- it is entirely made up of artifacts -- emails, files, letters (friendly, business, and some threatening legal action), maps, illustrations, resumes, church bulletins, Boy Scout information, discipline referral forms, "prison" journals, Thad's defense argument, and many others as well. These artifacts are the vehicles Gosselink uses to tell the story of Thaddeus, and each layer allows the reader to see that Thaddeus is far more than just a class clown. He is someone who is trying to control his environment in a time when he feels he has no control in life. The artifacts remind me a lot of how Wendy Mass set up Middle School is Worse than Meatloaf. The reader is required to do much inferring about what has happened when it is not explicitly stated. The book also reminds me a little of the Roscoe Riley series in that the reader finds out immediately that Thaddeus is in trouble at school and serving in-school suspension time. The rest of the book unravels how that suspension came to be. Because of that format, I sometimes had to recheck dates of events, because the plot of the story jumps back and forth in time. It wasn't a detractor, it just made me think a little harder about sequence. I also loved how much Thaddeus enjoyed words -- he is a member of The Young Etymologists group (membership: 1), and spends a great deal of the book sharing definitions of great words in the letters he sends his principal, assuming the principal wouldn't know the meaning. One of my students finished reading this yesterday and I immediately snagged it before it got returned to its rightful owner in hopes that today would be a good reading day. I got lucky, and it turned out to be a perfect day for reading The Defense of Thaddeus A. Ledbetter. I had to order it today so that now a copy can live in our classroom. I might even suggest it for the next round of student book clubs. :) Great book, great character!! See Franki's thoughts about Thaddeus and the book during her January reading reflection. Today is our 3rd birthday, and we'd like to celebrate what we've accomplished in our "toddler" years. Three years ago, our blog was "born" on a cold Groundhog's Day at a Panera in Clintonville. As we sit in a Panera again (this time in Hilliard), 3 years later, we realize we've come much farther than just across town. Today, we'd like to celebrate some of our toddler milestones. We had to learn the ins and outs of blogger and blogger dashboard, and were initially overwhelmed by the technological demands of blogging :) . Karen has been living in the world of PLP this year. Bill hosted a Grand Discussion with unintentional results. We mostly blog about books we love, but we have used our blog as a vehicle to share about other things as well (family, life events, items of interest in our classroom/library). We learned to share and play with others. We started by following 8 - 10 other blogs on our blogroll. Now, we have over 64 blogs listed on our roll and 14 websites we follow. And that doesn't even take into account what lives on our Google Readers! We went to KidLitCon in 2009, and met some of our blogging friends and mentors face to face. Being members of the Twitter community has changed our lives forever. It has linked us to more great thinking and great blogs. It continues to help us grow exponentially. We are proud members of the Central Ohio blogging community. We are also proud members of the Central Kidlitosphere. We contribute on occasion to Poetry Friday and Nonfiction Monday (both of which we would like to do more often). 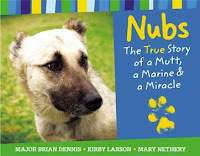 We try to do our small part in the Kidlitosphere with our Looking for Newbery posts each year. Karen had an opportunity to present at NCTE 2009 about how blogging has made her a better reading and writing teacher. We have both been panelists for the Cybils awards. We learned to say “thank you”. We’ll be forever grateful to MaryLee of A Year of Reading for taking the time on a cold February day to meet with us and help us get Literate Lives off the ground. We are also thankful for all the other mentor blogs that we read voraciously before we began this endeavor. Thank you for paving the way for us, and welcoming us when we joined the kidlitosphere. We are SO grateful to everyone who either stops by regularly, or visits on occasion. It is so nice to know that we have an audience with whom we connect. We are also grateful to all the authors who visit and comment on our blog – without your books, our blog would not exist. It will always be a thrill to see an author’s name in our comments section. Our toddler years have been a lot of fun here at Literate Lives, and we’ve learned so much along the way. Thanks for being part of our growing years. One of my amazing parent volunteers recommended a book to me that she and her daughter had been reading and as I always do, I immediately went to my computer and reserved it at the library. As usual, I was not disappointed, the parents in my building are full of excellent suggestions. 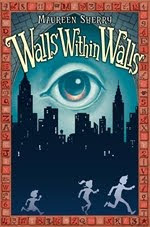 Walls Within Walls grabs the reader from the start. I was immediately hooked on the mystery and trying to solve the puzzles and codes that make it up. The book by Maureen Sherry reminded me a lot of Blue Balliet's books. 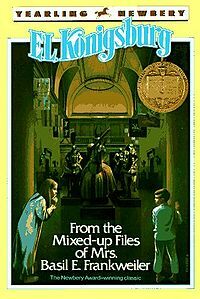 They both use real historical people, buildings and artwork to set up fascinating mystery stories that beg to be solved. The Smithfork children, Brid, CJ, and Patrick are moved from their comfortable neighborhood and normal, middle class life, to a ritzy 5th Avenue apartment when their father hits it big in the video game business. None of them are very happy about leaving their friends and schools behind. It forces them to become closer since none of them have any other friends at the new apartment. During a bit of rough housing on moving day, they uncover a painting of an eye that is huge. It seems the apartment they have moved into used to belong to the Post family, inventors of packaged foods and friends of all of the beautiful people during the early 1900s. When Mr. Post died it was stipulated that the apartment's original walls must never be changed, so walls were built inside of the originals so the apartment could be cut into smaller units...walls within walls...get it!? The kids lower the littlest brother down between the walls and he discovers something that sets them on the hunt for the mysterious, lost Post fortune and inheritance. The search involves secret codes, a secret map, long lost Post children and a historical tour of NYC that could make a very cool field trip or family vacation. For her first novel Maureen Sherry based her story on her experiences of moving into a historic apartment with her family and the mystery she built for them. She includes just enough detail and intrigue to keep a kid interested. The adventures on the streets of NYC and the ways the Smithfork kids get out of the house to investigate bring back thoughts of the Jamie and Claudia Kincaid investigating the secret of the angel. I liked everything about this book and look forward to the sequel and more adventures with the Smithfork children. I will be recommending it to my fourth and fifth graders.